China and Domain Names. It’s all about Data Now. Data. I love data. And today, investing in domains is all about data. As Shane Cultra said a few weeks ago, “If you’re not in Chinese domains right now you’re out of the wholesale market.” Not 100% accurate, more like 110%. Everybody has seen this type of scenario before. A product gets hot, buyers rush in, everybody’s making money and then a bubble pops. I am going to go on record and say my opinion is there will be a bubble, but not any time soon. And when that first bubble pops, it will simply be a slight correction to a foundation not even formed yet. What is happening right now is the most important thing to ever happen in the domaining world. Up until China started investing heavily in domains, choosing assets to invest in was part art, part science and part gut. Over the years, I have seen so many different opinions on domain name values for brandable and keyword domains. While this data played some role, the value typically ends up based more on a gut check than anything else. Comparable sales data of brandable and keyword domains can only do so well because metrics used from one sale to another are rarely strong enough to warrant broad extrapolation to similar domains. Sellers often use data like the Google Adwords Keyword Planner to identify the number of searches each month for a particular keyword or phrase. However, if there is no direct navigation traffic (people typing in the domain name), then the owner must develop a website and get on page one of Google to take advantage of that traffic. Otherwise, it really means nothing. Secondly, my guess is that over 50% of all keyword and brandable domain sales would never had a second buyer anytime soon. It’s one of the main reasons why looking at DNJournal every week is such an addictive read. You never know what’s going to sell. Furthermore, most sales are from inbound leads, which is not the result of 12 people fighting for a domain in auction. It’s typically the result of one person with an emotional attachment to that name. This is a core issue behind the problems in extrapolating sales data for broader valuation analysis. Numerous other factors exist that make the challenge of quantifying domain name values using an algorithm nearly impossible. Luc and Essa from Estibot are brilliant people. Many of the world’s top technology companies would love to have even a clone of either one who is half as good. Yet, even with all the resources they have, automated domain name values for brandable and keyword domains are still hit and miss when compared to the accuracy of appraisal systems for traditional industries. Take real estate, for example. Ten appraisers could assess the same house and likely come in within 15% of each other. Take 10 automated systems in this industry or even ask 10 true professionals in this industry and you’ll likely see variances of 50-75% – resulting in a valuation that ultimately has more to do with your gut than with data. Did I mention that I love data? Domain name investing for the China market is now based on data. Four-letter (4L), five-letter (5L), three-number (3N) domains … Whatever the data set is, one can break this set down and find floor prices for a wealth of patterns. Double letters, beginning and ending 8s, double repeating, etc. And these patterns mean something, since underneath it all we have an extremely large amount of buyers who satisfy the demand. This is not going away, in my opinion. If two-number domains dropped in value tomorrow and China wanted out, then only a small percentage of value would fall before Western bidders all bought back in. Same with four numbers, four letters and even longer strings. The underlying difference in why this data is so much more important (and relevant) today for Chinese domains is that brandable and keyword domains do not have the same liquidity factor nor the same amount of people lining up to pay $25,000 for a domain. The wholesale market can be 75-90% cheaper than end-user sales. In China, this wholesale demand is the market. Almost none of these domain names will ever get used. They are being treated strictly as commodities, and we are still in the first stage of this investment: Building a foundation. No popular CHIP (acronym for Chinese Premium) domain name seems like it is going to fall off the charts. Why? Because we are likely not anywhere near the top of the mountain yet. People are acquiring portfolios, registering domains and positioning themselves. And there is a lot of that still to do. There is also a beautiful difference between Chinese and Western culture. China is a culture where people are taught about saving and building wealth from Day One. North America, on the other hand, is a consumer-based society where we spend, spend and spend. There is an entirely different mindset for building wealth in China and this is something, together with the portable liquidity of these assets, which I truly believe is core to the growth of domain investing as a long term asset class in China. Oh, the big picture. I don’t think that reported sales are showing enough of the big picture. Why? There is so much inventory being purchased under value at the moment: from buy it now, closed auctions and private sellers. Many owners are not aware or simply have no idea how to price domains right now and – rightfully so – many of us are still trying to understand the China market. I spoke to one of the largest domain portfolio owners yesterday and they said: “We are just getting into this market now. Not sure how we really missed it.” Think about it – How many other corporate and private owners who list names on marketplaces follow the daily domaining topics as most of us do? A small fraction, is my guess. Domaining is still only a full-time job for a relatively small group of people and many of the employees who run domain portfolio sales are not domainers. They simply have goals to meet and, if all is well, then hey, all is well. Many auction houses are doing extremely poor jobs of showcasing inventory. Sedo, for example, just added a numeric-only search function in early November. SnapNames still doesn’t have one. Many auctions are closed, so those buying need to understand where to place backorders, etc. There are visible differences where you buy domains resulting in arbitrage (buy on Snap, sell on NameJet, for example), and many more undermarket sales happening. The good ol’ days of being in private auctions may very well come to an end soon. In fact, except for personal gain, I really don’t see any reason to have private auctions anyway. As long as bidders are verified, it doesn’t make any sense from a business perspective to limit the last three days of bidding to a closed group of people. People will follow the gold and that gold is inventory, doesn’t matter if auctions or private or public. NameJet is likely the most important player in the West right now. Not only do they provide an API feed for their inventory, but they’ve also been quick to add a numeric search function, have quality standards for sellers, an exclusive lock on Network Solutions expired inventory, longest payment terms and holding more and more public auctions. DropCatch and Pheenix are also opening up public auctions once a domain name is caught. And registrars like NameBright are advancing bulk tools every day for owners – seriously, try their bulk search of 5,000 domains at once. You will never go back. Many companies who used to run the drop markets in this industry are being phased out by people who realize the potential in China, listen to buyers and sellers, and have the nimble resources to adapt. This innovation is resulting in greater tools, more opportunities and a more efficient marketplace. All of this would never happen at this pace without the demand from China. 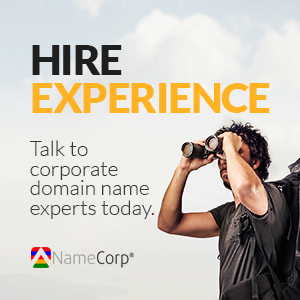 NameCorp™ is a boutique digital agency with an insane appetite for naming and more than 20 years of experience. Contact us to learn more about finding a better domain name. Alan Dunn is a senior digital naming expert and brand consultant with over 20 years of experience. He is the Managing Director of NameCorp®, former Managing Director of Domain Holdings (acquired by Flippa) and, a contributor to Tech Crunch, Business Insider, Quartz and other key publications. Alan was also nominated to the TRAFFIC Domain Name Hall of Fame in 2014, won TRAFFIC Developer of the Year in 2012 and has appeared on BBC One Radio. Follow Alan on Twitter @alangdunn.